FCO officials are “still assessing the suitability of the full flight records for publication”, nine months after they were first requested from the government by human rights NGO Reprieve. Campaigners believe that the logs — written records of all flights landing on and leaving the atoll — could provide crucial, previously undisclosed details of flights involved in the intelligence agency’s post-9/11 rendition and torture program. However, the UK government has so far declined to publish the logs, and has dismissed the new claims made by a former senior Bush administration official — published by VICE News— that the CIA did in fact detain prisoners on Diego Garcia, despite years of assurances from British ministers to the contrary. Lawrence Wilkerson, former chief of staff to Secretary of State Colin Powell, told VICE News in January that the island was home to “a transit site where people were temporarily housed, let us say, and interrogated from time to time.” His information came from four well-placed CIA and intelligence sources, he said. Swire said that the British government “seeks regular reassurance from the US government” on renditions, in the letter dated March 3. “All previous assurances on transfer of detainees provided by the US government since 2008 remain valid and correct,” Swire wrote. “yet we still seem no closer to the publication of flight records which could provide crucial evidence of what went on. 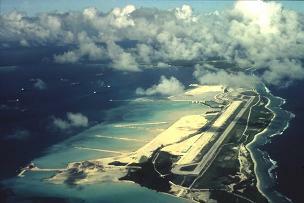 It is far from the first time that Diego Garcia’s role in the CIA’s post-9/11 rendition and torture program has been disputed. The tiny atoll in the Indian Ocean, which has been leased to the US for use as a military base since 1966, has been the subject of CIA torture program claims and counter-claims stretching back more than a decade. The release of the Senate Intelligence Committee torture report in December confirmed that the CIA did operate a post-9/11 global rendition and torture program, with secret prisons all over the world — but the heavily redacted document did not reveal whether Diego Garcia was a part of the CIA’s international network of black sites. David Miliband, then the foreign secretary, tells parliament he is “very sorry indeed” to report that contrary to earlier assurances, two rendition flights carrying a single detainee each did, in fact, land on Diego Garcia. July 2008: … but the UK claims that records on these two flights — and for the whole of 2002 — are no longer held. Miliband tells the Intelligence and Security Committee (ISC) that records “are unfortunately no longer held for the period when the two cases of rendition occurred ,” because they are generally only held for up to five years. July 14 2014: … but then the foreign secretary says he believes that there’s actually a complete set of flight logs for 2002. He says that “a small number of immigration arrival cards from 2004” have been damaged, however. VICE News obtains the government’s own records which show that the so-called “extremely heavy weather” in June 2002 amounted to 3.25 inches of rainfall — considerably less than the average for that month. “I don’t think it’s very helpful for us to have a discussion about how much rain is a lot of rain,” a FCO spokesperson told VICE.